Most pesticides kill a wide variety of insects. As such, the pesticides sprayed on your prize roses to control rose pests can wipe out untold numbers of beneficial insects living nearby. By the same token, pesticides often move far beyond the place where they are applied. For example, chemicals sprayed on a windy day can drift into your neighbor's yard and beyond. Runoff after a spring or summer rain can carry a lethal load of chemicals into the water table or a stream or lake. The thing to keep in mind is that the vast majority of wildlife that inhabit your yard depend on insects sometime during their lifetime. Take birds, for example: It has been estimated that 90 percent of all nesting birds feed on insects. If you kill or contaminate the insects they feed on, you affect these birds, too. 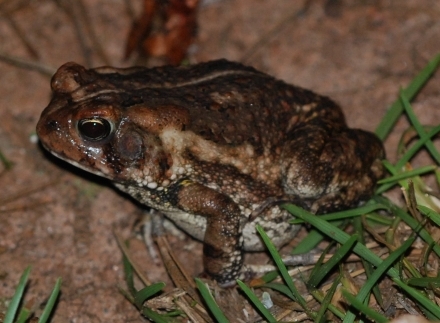 Since frogs – and all toads are considered frogs – often feed under the cloak of darkness, these valued wildlife neighbors are often the forgotten creatures in your yard. In spite of the fact they nightly devour scores of mosquitoes, beetles and other insects that make life uncomfortable for you or dine on your flowers and vegetables, many homeowners leave them off their list of valued wildlife neighbors. This is a grave injustice, as frogs are also great indicators of the health of our backyard environment. Since they eat a variety of insects, lots of frogs hopping around your flower beds is a sign you are probably not overusing pesticides. This is especially true if a lake, stream or wetland (the breeding habitat for frogs) is nearby. The reason for this assessment is that frogs are extremely sensitive to environmental contaminants. They can be killed when they come in contact with deadly chemicals, when they eat poisoned insects or when they lay their eggs in contaminated water. If you must use a pesticide, do a little research about which one to apply. Your local University of Georgia Cooperative Extension agent is a great source of information. Some chemicals are more deadly to aquatic life. Others are especially lethal to birds or beneficial insects. If one is highly toxic to the animals that inhabit your yard, don't buy it. Also, be aware of the fact that insect repellents containing DEET are particularly lethal to amphibians. Most of us have been guilty of not following the manufacture's recommended application rates. It is easy to believe that if a little dose of chemical does some good, a big dose will do even better. Actually the reverse is true. More further increases the chance of contaminating our yard with deadly chemicals while even endangering the health of our families and pets. Children are especially susceptible to pesticide poisoning. Always keep pesticide use to a minimum. Often, garden and yard pests can be controlled by simply plucking them from the plants. If you do spray, spot treat whenever possible. And do so on a calm day. This will prevent poisons from drifting to areas where the treatment is not needed. Also, encourage natural predators in your yards. Ladybugs, robber flies, dragonflies, spiders, praying mantises, birds and a host of other kinds of wildlife can make a major dent in your backyard pest population. Include native plants in your landscape. Many of these plants need little or no maintenance, require less water and are more resistant to insects and diseases than a lot of our favorite ornamentals. When trying to control unwanted vegetation, before you engage in chemical warfare, try chemical-free methods of weed control. These include mulching, pulling, hoeing and digging. Pesticide safety extends well beyond the application of these products. Proper storage and disposal is imperative. Always store pesticides in their original container and far beyond the reach of children. Keep the directions with the container. By so doing, you will not have to rely on your memory when you use them again. When disposing of a pesticide or its container, don't simply throw them in the trash. Contact your local waste disposal agent or local recycling facility for directions. Decades ago, biologist and author Rachel Carson was perplexed by reports that American robins and other birds were dying in suburban areas. Her research into the die-offs led to the discovery that the culprit was DDT sprayed on stately elm trees to thwart the spread of Dutch elm disease. As we all know, this led to her writing “Silent Spring,” the book that alerted us to the harmful effects of the overuse of pesticides on wildlife and humans alike. Since that time we have learned how to use pesticides without jeopardizing ourselves and our wildlife neighbors. If you want to be a good citizen, enjoy a beautiful yard and reap the benefits of a plentiful and diverse wildlife community, use pesticides wisely.